When Christmas or Easter time comes around each year, our family often has a ham. For us, it's a big dinner. Or, to use an old fashioned expression, a feast. The table is loaded with roasted potatoes, roasted squash, steamed asparagus, cauliflower with butter, buns, salads, and more. But the centerpiece is the stunning roast ham. 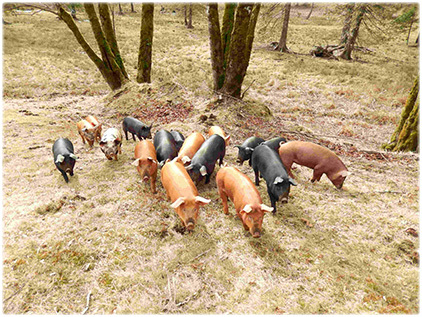 Because we raise our own certified organic soy-free pastured pork, the festive dinner provides us with the added blessing of knowing it's healthy food from happy pigs which experienced the pleasure of bright sunshine, green pasture, fresh air, fertile soil, and plenty of herd-companionship. It is really a joy to know where your food comes from. One of the many unique things about our hams is the exceptional flavor of the meat. Part of the reason for that is the special nature of the fat. It's good fat, filled with nutrients which heal our bodies and nourish our bones. Researchers say that fat from outdoor pigs is rich in monounsaturated fats and vitamins A and D. In fact, according to the Weston Price website, lard from outdoor pigs is second only to cod liver oil in its vitamin D content. One hundred years ago, lard accounted for approximately 70 percent of the edible fat market in the US. The pork fat was rich in vitamin D because most of the pigs of that day were raised outdoors. Today, the edible fat market is dominated by soybean oil, which lacks vitamin D. Currently soybean oil represents 65 percent of the edible fat market in the US, whereas lard from outdoor pigs has a nearly zero market share. All this is important because the culture is chronically deficient in vitamin D --- in fact, 42 percent of the population is deficient according to the National Health and Nutrition Examination Survey. But in order to get the full benefits of lard, the pigs have to be raised outside, where they can concentrate the UV in their tissue. The fat from conventional indoor-raised pigs is nutrient deficient for several reasons, including a complete lack of sunshine. Remember when butter from outdoor pastured cows began to experience a renaissance a few years ago? The same thing is happening now with outdoor-raised lard (and pork fat in general) --- with some scientists claiming the health benefits exceed butter. If you haven't gotten aboard the lard-train, now is the time. It's healthier than you imagined, especially when the lard is from certified organic soy-free pastured pigs. As far as we know, we are the only source in the greater Vancouver region. for outdoor pigs in order to avoid sunburn. And there's another special thing about our pork. We raise heritage breeds --- the ones which were prevalent a hundred years ago. They are very different from today's conventional pigs, which are the pink hairless type which are meant to be raised indoors, in confinement, with very little fat on them. In fact, modern pigs are bred specifically for leanness, meaning the amount of lard they produce is relatively small. Our ancestors would never want today's conventional pink barn pigs. Rather, they wanted pigs which would forage and thrive outdoors, not get sunburned, have good maternal instincts, and have plenty of lard. When you are buying your Christmas or Easter ham, consider one with the bone-in. Chefs agree, meat is more flavorful when it's on the bone. That's because the minerals and marrow from the bone saturate the meat, imparting a richer flavor and increasing the nutrient density. If you haven't read about the myriad health benefits of bone marrow, please consider reading the blog post. Although it refers mostly to beef bones, exactly the same qualities apply to pork bones. 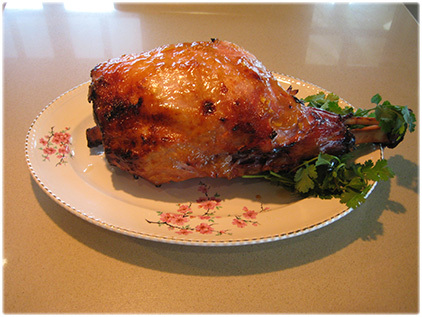 Besides, health benefits aside, when you roast your Easter ham with the bone-in, you'll find the taste is a real joy. This is our boar, a really gentle creature. He's hiding in the tall grass, searching for treasure in the soil. All these health benefits of pasture-raised organic pork are very important to us. But what's equally important is the way the animals are treated. How they live. Seeing them laze in the sunshine, shoveling dirt with their noses, foraging for roots and bugs. 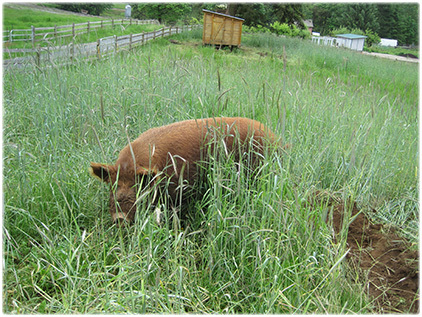 This is how pigs were designed to live --- on green pastures, outdoors, under the sky, and on the living soil. The benefits of a festive Christmas or Easter ham go way beyond the meal itself. Our family enjoys left-over ham sandwiches for a few days afterwards, which make an incredibly delicious lunch. One of the things we especially appreciate is the amazing Berkel meat slicer we invested in, which allows us to cut our meat as thin as we like, and is an almost essential tool to put leftovers to efficient use. And then of course there's the leftover ham-bone with plenty of meat fragments left on it. This is where the spectacular Canadian-style split-pea soup comes in. It's something my mother in-law makes and it's particularly wonderful because it not only warms your insides and soothes your soul, but it also freezes nicely. The convenience of being able to pull it out of the freezer on a cold day for a quick, nutritious lunch is no small thing. 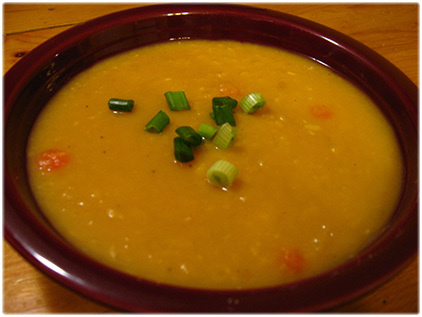 Split-pea soup is a delicious and uniquely Canadian way to enjoy leftover hambones. This is one way a bone-in ham really provides tremendous value: it provides several meals, all of them delicious. From the holiday feast to the ham sandwich lunches to the split-pea soup, these traditional hams just keep on giving. It's no wonder our ancestors ate so much of it. This Christmas or Easter as you plan your special meal, consider going with a traditional ham --- from certified organic, soy-free pastured pork. You can place your order here. We hope you have a joyful and refreshing long weekend. We are so grateful for all our wonderful customers. Thank you for supporting our local, certified organic family farm.